Nothing evokes the onset of spring and summer in the Northwoods more than the haunting call of the loon. Mournful loon phrasing and trilling before dawn and at twilight can be as soothing as the rhythmic slap of wavelets against a scow. Loon wails can make a heart begin to ache, and their hoots and yodels can signal recognition that all is well. The tremolo has been described as “insane laughter”; it is 8 to 10 notes voiced rapidly which vary in frequency and intensity. This alarm call usually indicates agitation or fear, often caused by disturbance from people, a predator or even another loon. This is also the only call that loons make in flight. The wail is most frequently given in the evening or at night, and can be heard for many miles. This haunting call is not an alarm call but is used to keep in contact with other loons on the same lake and surrounding lakes. The yodel is only made by male loons. This call is used to advertise and defend their territory, especially during incubation and early chick-rearing. If you are watching loons and they make this call or a tremolo, it usually means that you are too close and are disturbing the loons. If that happens, you should leave their territory and give them their space. Loons are swift divers, and thus great at fishing. They’ll abruptly disappear beneath the surface and emerge unexpectedly hundreds of feet away. Loons will return to the area where they were hatched, and pairs are very territorial. Chicks incubate for 28 days, and then peck their way out of their eggs, ready to swim. Frequently they hitch a ride on their parents’ backs, though, in one of the most appealing traits ever. The loon pontoon doesn’t ensure a totally safe haven. Even though Grandpa anchors it in the reeds, depending on the year, the sitting parent (both take turns incubating the eggs) is exposed to predators from the sky (eagles and ospreys) or in the water (muskrats, otters, and rogue single loons). It must be nerve-wracking. The loon often scans the sky and its surroundings, and its mate will often reappear from fishing to do guard duty and take a turn on the nest, too. Watching the shift change is fascinating, too. Loons are so graceful in the water, but they approach the nest from one side and clamber up onto the pontoon on one side in a clumsy fashion, finally settling in. The dimensions of the pontoon have to be sufficient so that it doesn’t tip from the weight of the adult’s movements. After several years, Grandpa redesigned the loon pontoon. The wooden structure became waterlogged, so he switched to lighter weight materials, including pvc pipe underneath to make the frame. The middle is heavyweight woven galvanized wire, so it holds the heavy nest and doesn’t rust. You can get a good look at the nesting loon from this year in this photo that Pete took last weekend while we were up at the cabin. We were hoping that this would be the weekend that the egg would hatch, but no such luck. Babies come when they’re ready and not before! This year the nest is more exposed than it has been in past years. This means it can be more easily seen from the sky and from the water. Pete was standing at the window this weekend when all of a sudden a bald eagle swooped into the lagoon. The eagle’s aerial theatrics were enough to frighten the parent loon off the nesting platform and into the water. Pete was screaming and hollering for the half a minute the spectacle occurred. The eagle didn’t take the egg, however. Tragedy averted this time. 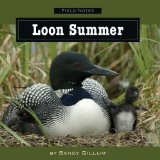 This year for our anniversary, our friends Judy and John got us a signed copy of Loon Summer, by Sandy Gilllum. Sandy and her husband have a loon pontoon in Wisconsin. Her narrative contains history and behavior, as well as thrilling photographs of hatchlings. Sandy has done an amazing amount of study and has captured the world through the loon’s eyes in this book. Some years our pair has had two eggs, which happens quite frequently. This year, there is just one. A couple of years ago, it appears we had a pair mis-match. The male just couldn’t seem to “get” what he was supposed to be doing, and the nest was abandoned in mid-season. Three loons frequented the area that year. We wondered if they were adolescents who weren’t quite ready to settle down. Reading Sandy’s book has shed a little light on some of the more mysterious behavior, as well as the typical parenting loons do. My brother, John, called to say there is a pair of loons on our lake in Michigan this year, a remarkable occurrence. Usually, they don’t stay that far south. He is keeping his fingers crossed. Our land is an island-like peninsula, so maybe they will nest! We’re farther north in Minnesota. On Woman Lake there are many pairs of loons, and a full range of predators and food to support the population in a balanced ecosystem. It’s something we don’t take for granted. This is really a wonderful family saga floated around for everyone to enjoy. Thank you. My Uncle had a Loon Pontoon in the Lake o f the Woods Ontario and we so enjoyed the nesting pair, but the Lake was full of Loons and perch until a big forest fire. It makes me feel good to read this and remember my 2 big visits to the summer of the eastern lakes. Patricia´s last blog post.. And The Winner Is! Maybe we “bloggers” have more in common with loons than we realize! That’s what our blogs are for – sometimes we’ll use it as an alarm call – but most of the time we’re just staying in contact with other “loons” on this giant “lake” known as the blogosphere! Hi Patricia – Summers at the cabin can be about lots of work, too, but somehow I think it manages not to seem that way. Lake of the Woods is really spectacular. Pete and I camped up there in Zippel Bay several years ago. We traveled along the banks of the Rainy River and saw all the Maple Leaf flags on the opposite shore. Fun times! Thanks. Lovely Betsy! Your posts help me pay more attention to my surroundings….sounds, sights and colors. Thank you! Hi Jessica – Yeah, you don’t even have to see it in person to imagine, do you? 😀 Thanks. Hi Robin – Yes, loony adventures they are. I would love to see some sights and residents where you live, too! Thank you. Hi Mary – I’m so glad you enjoyed it! Now if we can just get some pictures of the chick. Thanks. This reminded me of On Golden Pond. It’s nice to see the loons and what they’re doing in their wonderful human-made habitat. I’ve heard the calls of loons (only the soothing kind, not the loony laughter), but never seen one in real life. At the building where I work, every year a wild duck has her babies on the roof, which is furnished with outdoor furniture and plants in large pots. And every year “the duck man” comes, nets mother and babies, and makes sure they get safely to the nearest watering hole. Hi Betsy. I loved reading this story and listening to the different loon calls. My mother used to call our attention to the loon call and we grew to listen for it. It was a treat to hear it. And this is great… building a pontoon for them — love it! Hi Dot – The “duck man” – I love it! We are seeing a lot of Canadian goslings now. The geese are so prevalent they’re an official nuisance, but the babies are so cute. And yes, there are plenty of On Golden Pond moments at the cabin, trust me. 😉 Thank you. Hi Betsy – The loon pontoon was a brilliant idea. It must be tough for them trying to protect their eggs from predators though. We don’t have loons here. But on the road where my parents live – peewits nest each year. And every year the babies seem to manage to get out onto the road. Last weekend we spent ages catching them and putting them back in the field, or they’d just get run over. Cath Lawson´s last blog post.. What Can You Do When Your Life Is Stuck? Hi Cath – I had no idea what a peewit was so I had to look it up: http://en.wikipedia.org/wiki/Peewit How fascinating! They are a type of plover, which we have here, but the adults are quite large aren’t they? The Canadian geese tend to ignore traffic with their families here, so I know what you mean. Would you have ever thought that we’d be discussing birds like dotty oldsters in khakis and Gunga Din hats? Where’s my butterfly net? 🙂 Thank you. Loved the Loon Pontoon info. Makes me want to pack up and head to the quiet north where the loon call can lull me to sleep at night and awaken me in the a.m. I envy those living on lakes that do this daily. Thanks for sharing! Keep the stories coming!